Inside a chilly brick-walled warehouse, Brown-Forman executives told a small gathering of spirits journalists that it’s bringing back its King of Kentucky brand, a powerhouse 14-year-old whiskey set for a June release and at a $199 MSRP. I’ll admit it, I’d never heard of King of Kentucky, and except for some whiskey wonks among us, I’m betting no one else had either. 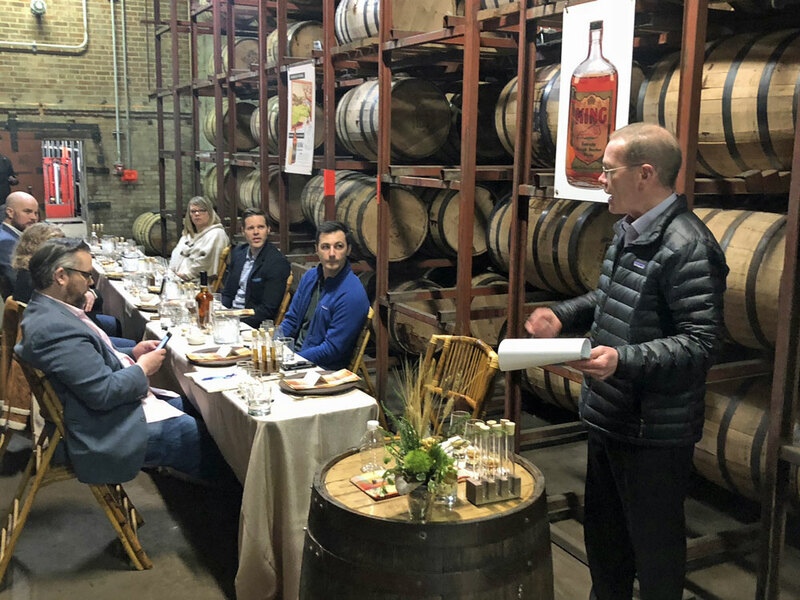 Few in the room were even born when Brown-Forman sent the King of Kentucky into exile in 1968, when it was a 1-year-old whiskey blended with grain-neutral spirits. If you can taste that mentally, you know it’s not a stretch to say drinkers were pardoned by the King’s absence. Now, however, with the interregnum behind it, the King is headed back to the throne, this time as Brown-Forman’s most expensive bourbon ever released. And based on its lineage and the sample we sipped, this emperor not only has clothes, it’s stylin’! More than a decade ago, when the fires of bourbon’s return began to glow, B-F master distiller Chris Morris earmarked several barrels for a special long-aged product. 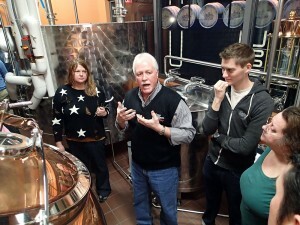 Born of the Early Times mashbill (79 percent corn, 11 percent rye and 10 percent malted barley), the barrels would spend the next seven years in one of the company’s heat-cycled warehouses in Shively. Later, Morris moved them to Warehouse O, the company’s only ambient temperature storage to slow the whiskey’s maturation. Seven years later, and after losing an average 70 percent of those barrels’ contents to some thirsty angels, Morris deemed the maturate ready for market. Based on the surging demand for high-proof whiskeys, the market is more than ready for The King of Kentucky. Since each bottling will be done from single barrels, proof will vary from 125 to 130. Every bottle of this initial 960-bottle release will be signed by Morris, who joked about anticipated hand cramps. The King of Kentucky will be a royal pain in the neck to bottle. For example, at Woodford Reserve in Versailles, bottles are filled at the rate of 100 per minute. By comparison, bottling this spicy sovereign will happen at the lowly pace of about 100 per day. The manual machinations required to fill each bottle, label it, enrobe its top and neck in black wax, sign it and then place it into a metal cannister is the work of indentured servants. But as Team B-F said repeatedly, this whiskey isn’t about mass production or even making money, it’s about making a quality statement. Sadly, for the many bourbon drinkers who’ll want this, a mad dash will ensue to get it. Equally certain: Those who seek it on the secondary market will pay a king’s ransom for it. 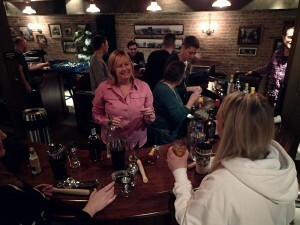 This question was inevitable in a spirits service class in the Bluegrass: “Every bartender in Kentucky should know at least three drinks. What are they?” asked Gary Gruver, our instructor. The group replied Manhattan, Old Fashioned and Mint Julep. Gruver acknowledged those answers correct, but added that too many bartenders screw up all three routinely, even here in Bourbon Land. Old-Fashioned: In to a cocktail tumbler place one cherry of your choice; add a fresh orange peel—not the fruit—and express its oils into the glass; add 2-3 dashes of bitters; a ½ ounce of your choice of syrup (a Demerara simple syrup made of half water, half sugar is swell); muddle with just a few firm strokes. Fill about halfway with ice and add 2 ounces of 90 proof or higher bourbon and stir until chilled, about 10-15 seconds. Manhattan: To a mixing glass add ice, 2 ounces of 90-proof or higher bourbon, 1 ounce of sweet vermouth and 2 dashes of bitters. Stir—“Never shake a Manhattan because it makes the drink cloudy,” Gruver said—until well chilled, about 20 seconds. Strain into a chilled up glass or tumbler and garnish with a cherry. * Should you want a perfect Manhattan, use a half ounce each of dry and sweet vermouths. The other half was sent upstairs to meet Charlie Downs, the artisan distiller at Evan Williams. In his 38 years working for Heaven Hill (which makes Evan Williams), he used to supervise the manufacturing of 1,000 barrels of whiskey a day at the company’s Bernheim Distillery. Now he makes just one barrel a day, batches of whiskey that will be bottled as unique products tied directly to the Evan Williams Experience. Downs led the class into the still room, a tight space packed with gleaming copper and stainless pipes, columns and boilers made by Vendome of Louisville. The machines are works of art, and the micro-distillery is kept as clean as an operating room. Bernie Lubbers, also known as The Whiskey Professor, then gave a presentation about the history of bourbon while leading us through an extensive whiskey tasting. Amid a rich bourbon history lesson, Lubbers told a story about a man who told him he owned the deed on Corn Island, a now-submerged piece of land near Louisville’s locks and dam on the Ohio River. 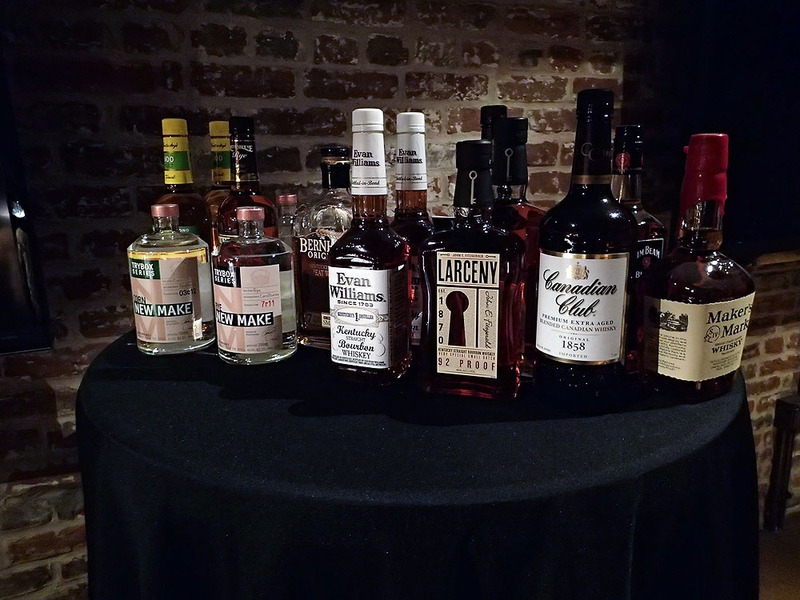 Lubbers’ presentation then turned toward the significance of Bottled in Bond (BIB) bourbons and why they’re special despite their surprisingly low prices. By definition, BIB liquor must be the product of one distillation season (January to December) made by one distilling company and at one distillery site. It must be aged in a federally bonded warehouse under U.S. government supervision for at least four years and bottled at 100 proof. That product’s label also must identify its distillery of origin and, if different, the site at which it was bottled. Perhaps more significant was Lubber’s point that BIB bourbons are hard to find outside of Kentucky.